Property 2: Independent villa, air-conditioned, two steps from the village, quiet with private garden. Beautiful Provence House in the Luberon - Heated Swimming Pool & Large Gardens. Property 19: Beautiful Provence House in the Luberon - Heated Swimming Pool & Large Gardens. Property 24: Nice holiday home with enclosed garden and private pool, close to the Luberon. Hillside Retreat w/ Stunning Views! June 2019 waiting for your visit!!! Property 29: Hillside Retreat w/ Stunning Views! June 2019 waiting for your visit!!! It really is a charming villa! The house is lovely. It was clean and comfortable and it felt very French. The walls are painted a pale yellow with cream colored trim. The house is bright and cheerful and the grounds are very inviting. We thought the kitchen was perfect with wonderful appliances so we cooked several times at the house. Everything was exactly as we expected. 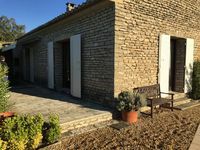 Excellent location in the beautiful hilltop town of Gordes. Gordes is a majestic picturesque hilltop town and this property is tucked away and ideally located within a 2-minute walk into town. The property is very private, it has a lovely outside eating area with a pool along with fabulous views. The kitchen was well equipped and the house was nicely presented and very comfortable.